Here we go: another epic week. Let’s get pumped up for this. 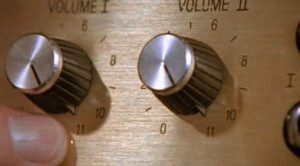 Every amp should go to 11. We’re going to start off the week by taking a look at the need for connection in It Follows. On Wednesday, we’re going to explore why it’s so beautiful that the gay experience doesn’t get stereotyped in The Broken Hearts Club: A Romantic Comedy. Thursday will give you five reasons to watch Bubba Ho-Tep (like you need them, but what the hell). And joining us again this week with The Outgoing Transmission is Nika Black, viewing Defending Your Life with her fabulous eye. Let’s crank it up to 11 and see if we can’t blow the windows out this week.